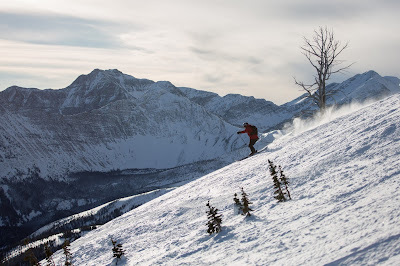 The Powder Stagecoach at Castle Mountain, one of only two cat skiing operations in Alberta, offers an amazing resort-based backcountry experience. Get first tracks in exclusive terrain with gorgeous views, a sweet ride, and knowledgeable guides. Besides the actual skiing, the best part was being able to put our kids in ski school for the day while we went out to play. Our adventure begins in a private meeting room at the Castle Mountain Day Lodge where we meet everyone. Cam and Doug, our guides for the day, hook us up with backpacks, avalanche gear, and bagged lunches before launching a crash course on avalanche safety. It's a good refresher as we haven't taken avalanche training or used a beacon in several years. While it's a sobering subject, we are comforted in hearing there hasn't been an incident in Powder Stagecoach's 8 year history. Next stop is the Huckleberry Chair. 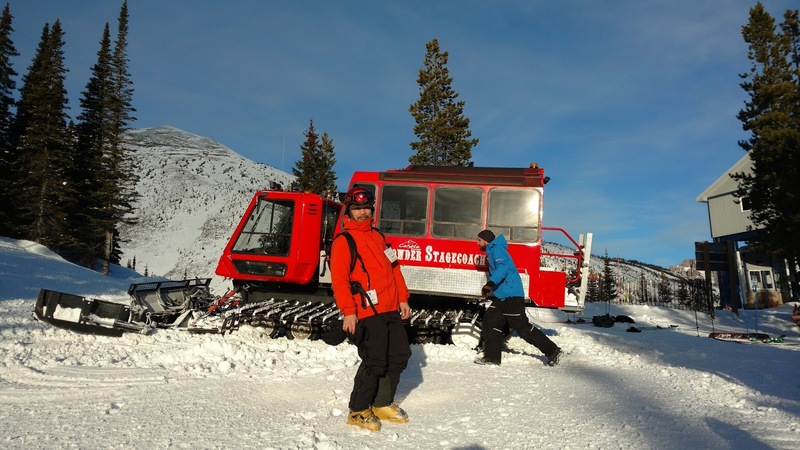 We will ride up, complete avy training, and meet the snowcat. It's a beautiful morning, mild and calm, unlike my heart. I gaze up at Mount Haig and wonder what the other side looks like - the cat skiing side. It's exciting, but daunting not knowing exactly what we're getting ourselves into. 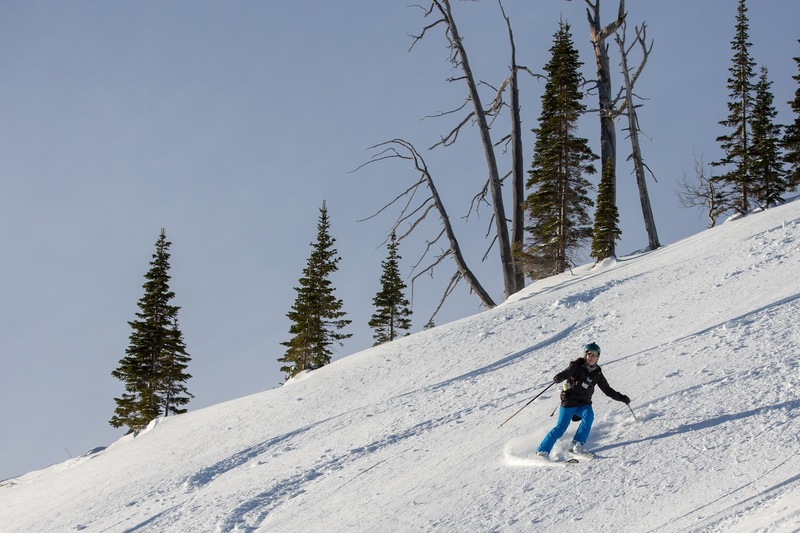 Jason Crawford, Castle Mountain Resort Sales & Marketing Manager, assures us the terrain is "mellower than the rest of the resort." That doesn't say much given that Castle has some of Canada's most challenging terrain, but I decide to put on my big girl pants. By the time we've successfully rescued a backpack (beacon practice), the cat is parked and waiting for us. "Hey, everyone gets a seat!" someone jokes. While the cat can comfortably accommodate 12, there are only 9 of us on board. The cat skiing veterans in our midst quickly hook up their iPod so we have tunes for the ride. Van Halen's Runnin' With The Devil sets the tone and everyone is jovial. 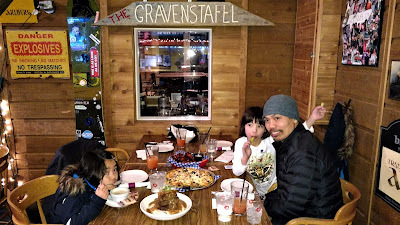 "We come here every year," the guy in front of us says gleefully, "One year we skied in 6 feet of powder!" Oh em gee... I can't even imagine! Our intrepid cat mates are warming up for a big trip to Revelstoke later in the season. 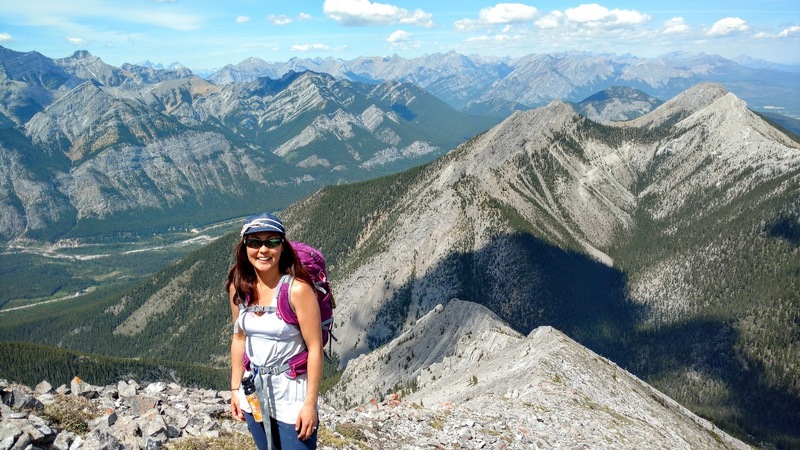 Castle, they say, is a great place to get a taste of backcountry skiing in a safe atmosphere. The mountain is checked frequently and bombed as needed to reduce the risk of avalanches. One long song (Hotel California) later, it's time to disembark. Our instructions are simple - head down one at a time and follow calls in the trees so we all go down the same way. At the bottom, take the ski out back to the lift and repeat. Oh, and smile for the photographer! We're the only people on the mountain and it's pure bliss. Aside from shusshing snow and the occasional whoop for joy, or signalling yodel from the guides, it's silent. There aren't even cars in the valley as the road is closed on this side of the mountain. I take a moment to savor it before making my first turns. Although there's another cat skiing group booked on the same day, we never see them as they ride up in the cat while we ski down. It's like we have our own private mountain! True to Jason's word, the terrain isn't too demanding pitchwise, but conditions are slightly challenging given the rain a few days prior to our arrival (rare for this area in January). I'm thankful for my sweet loaner skis that can bust through the hard stuff, and for guides who know where the powder stashes are! It's definitely more fun skiing powder and Castle usually gets a TON! 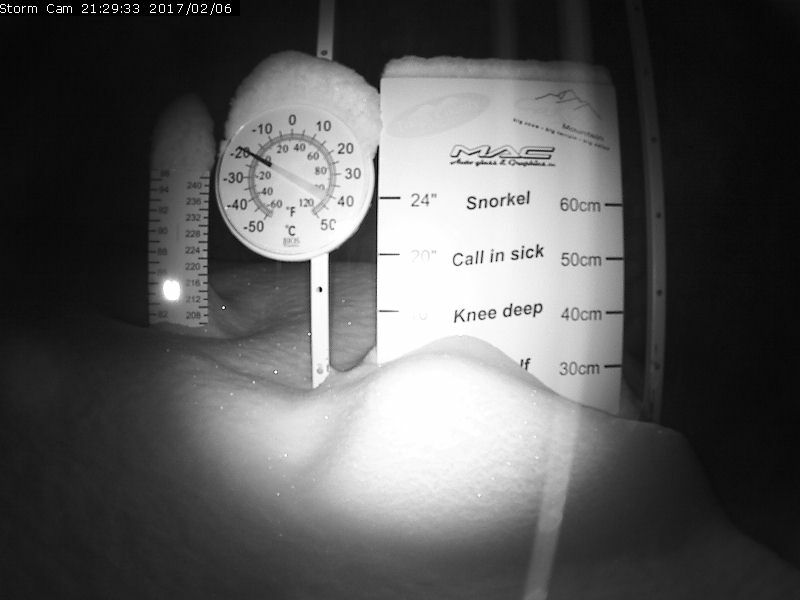 Two weeks after our visit, the mountain is hit with 90 cm of freshies. Next year, I'm going in February!! Almost 40 cm of snow in 24 hours!! After a fast ski out down Ski-Daddle Trail, we get to do it again. The cat drops us off at a different point on the ridge, so we can once more make first tracks. It's a pretty sweet setup! I wonder how they can keep ungroomed terrain "fresh" day after day and learn that the wind and new snow fill in tracks on the Powder Stagecoach's days off. The cat runs 'til 3:30 pm, but we duck out early to check on the kids (little one is shy) and take a break. We're happy to hear the girls made some friends, had a hot lunch, colored, watched a movie, and are on their second ski lesson! 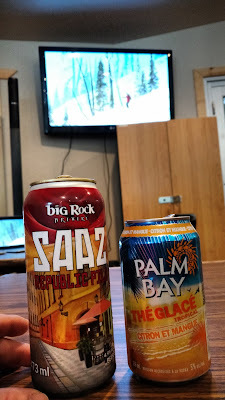 After a quick bite, we head back out to ski until it's time for the après. We debate doing a couple more runs with the cat or resort skiing, but we've missed the cat, so we decide on the latter. 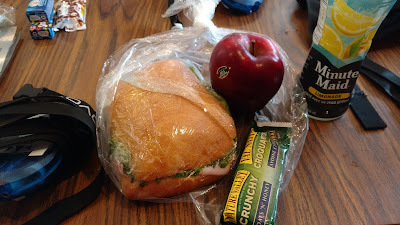 Mm.. lunch. Came with cookies, but I already ate 'em. Later, with drinks in hand, we mingle and check out the amazing photos from the day (professional photos available on USB for $30). The après event included in the cat skiing package is the perfect ending to a perfect day! I am inspired to ski better so I can go on more adventures like this! 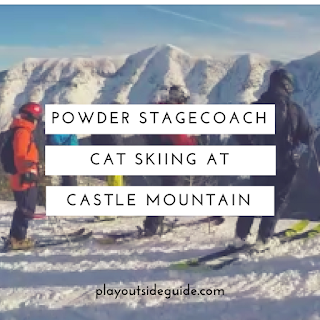 If you've always wanted to try backcountry skiing, but don't have avalanche training or gear, cat skiing with the Powder Stagecoach at Castle Mountain is the ultimate adventure made easy. 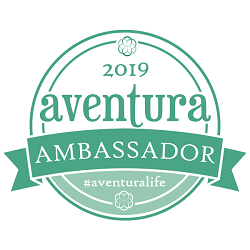 Besides not having to get yourself to the top of a mountain, avalanche gear and training are provided, the terrain is monitored and bombed as needed to reduce the risk, your group has its own photographer, and great guides know where to find the best snow! Fat ski rentals are available onsite at Alpenland Pro Shop, and continental breakfast, lunch, and a beer are included. All you have to do is get down the mountain! 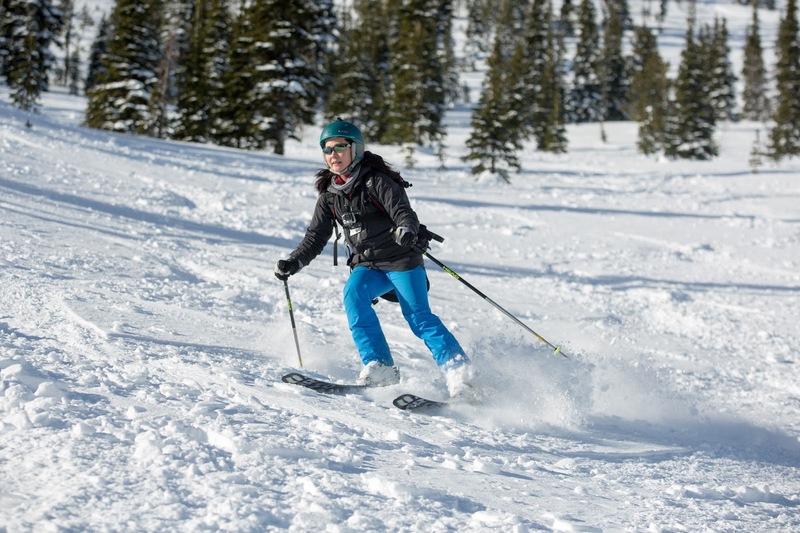 Read on for cat skiing tips! Check conditions: Check the snow report and weather before you book to ensure you have the best time ever! If there's a huge snowstorm moving in, don't delay as those cat skiing spots will go fast! Level check: Strong intermediate skiers will be fine provided you are comfortable skiing ungroomed terrain, powder, and trees. 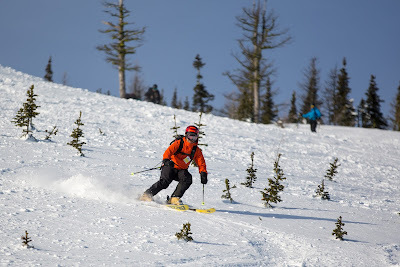 If you usually ski groomers, you can prepare by going off-piste and in the glades more often, and take a lesson on skiing powder (I need to get off the groomers more often and gain more confidence in the trees!). Kids must be 14 or older to cat ski/ride. Rent fat skis: These puppies float on the fluffy stuff and cut through hard stuff much better than regular skis. Rent from Alpenland (next to the Day Lodge) for $40. Keep warm: Dress in layers and bring a face mask and hand warmer packets for chilly days. The face mask keeps snow out of your face on crazy pow days too. Don't forget your goggles! Hit the can: Use the washroom before you go as there are no facilities in the cat skiing area. The good news is that the lodge is close to the Huckleberry Chair, so if you need to pop in during the day, it's a short detour. Prevent motion sickness: If you're prone to motion sickness, take a nondrowsy anti-nauseant at least an hour before you board the cat. I took ginger Gravol the night before and morning of our trip, and sat by the window, and was ok. The cat bounces a lot, but travels in a straight line, thankfully. Continue the après at T-Bar Pub: They have great pizza, anything you want to drink, and live music on weekends! Fun times! 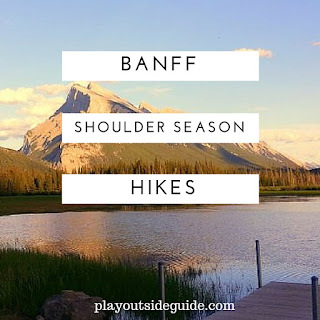 Castle Mountain is located only 2.5 hours from Calgary, about 40 minutes SW of Pincher Creek. To Reserve Your Spot on the Powder Stagecoach, or get more information, visit Castle Mountain - Powder Stagecoach. 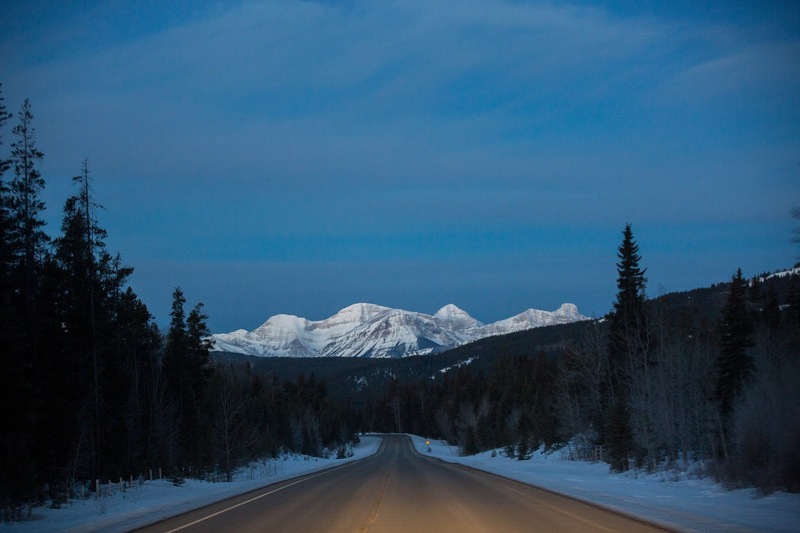 For more info on skiing at Castle Mountain, please see my story Destination: Castle Mountain Resort, Alberta. My whole family loves this friendly resort off the beaten path! 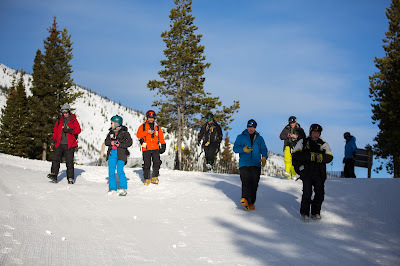 If you wanna see some of Castle's extreme terrain, check out this rad video by Resort TV! 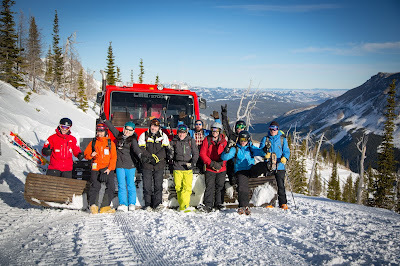 Castle Mountain generously hosted our cat skiing adventure (Thank you! ), but all words and opinions are my own.